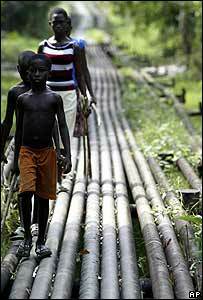 The west African state of Nigeria is the continent's biggest oil exporter. 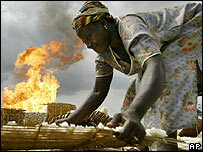 But despite its huge energy reserves and potential wealth, millions of people live in extreme poverty. Each Nigerian state has its own number plate slogan. Lagos, the pulsating home to 15 million-odd people, traffic jams and frequent armed robberies, is the Centre of Excellence, while Delta state has the tagline The Big Heart. This, I was later told by a Delta resident, is because of the courage of its people. For 50 years oil has been pumped from beneath the creeks, swamps and forests of the Delta, an area about the size of Scotland. It has earned the Nigerian government billions of pounds. Yet the communities in the Delta say they continue to live in poverty. Most of the promised development projects, like schools, roads and electricity supplies, have failed to materialise. Instead, they say, their land and water have been polluted by oil spills and their air ruined by the constant burning-off of natural gas. There is an apocryphal story often told about the origin of the disquiet in the Delta. In the 1990s the then military ruler, Sani Abacha, invited people from the Delta to the new purpose-built capital, Abuja. When they saw its huge, well-ordered roads, bridges and high-rise buildings, they realised what the oil money could do, and how little of it they saw. And so the trouble began. There are plenty of guns in Nigeria and plenty of gunmen in the Delta. Some are interested in the political conflict, some in robbery and extortion. Some, according to human rights groups, are paid and armed by politicians to help rig elections. Then there is the highly lucrative and illegal business of oil bunkering, the siphoning-off of oil from well heads and pipelines to sell on the black market. It is a racket estimated to be worth several billion pounds a year. And it is a large, well-run and at times an international operation. Last year, two Nigerian rear admirals were court-martialled for their part in the attempted theft of thousands of tons of Nigerian oil by an international crime syndicate operating in Eastern Europe. 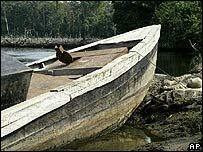 In the unspectacular sprawl of concrete buildings that is the town of Warri, I met a tall young boat captain called Henry. He was dressed immaculately in chinos and a white shirt. He held a mobile phone in one hand, and a Bible in the other. Like many, he had just spent his Sunday morning in church. He assured me it was safe to go onto the waterways. Up to a point. We sped along the river in a thin wooden boat heading deeper into the Delta, skipping over the brown salt water dotted with the floating green clumps of water hyacinths. Can alternative sources of energy really meet Africa's needs? Both banks, about a mile apart, were lined with dense green mangrove forests. Occasionally a clearing would reveal a small village of wooden huts and canoes pulled up on the muddy banks. And on the horizon, a plume of orange flame marked the site of an oil installation burning off natural gas. Creeks and inlets snaked off from the river in all directions, forming the maze of the Delta, accessible only to those with local knowledge. After 40 minutes we arrived at the village of Ekirimo. Its concrete jetty, the villagers insisted, was one of the few development projects they had seen reach fruition. We walked along sandy paths, among huts of driftwood, thatched palm fronds and rusting corrugated iron, to the village chairman's hut to introduce ourselves. The village was called to a meeting. They decided we could stay. The chairman, John Grisbe, was a short man who looked to be in his fifties. He had a broad grizzled face and sparkling eyes. He eloquently detailed their many grievances. No clean water, no electricity, shacks falling into disrepair, unemployment. And he said they had received scant help. The young men of the village took us to see what he was talking about. They showed us the brackish well, the half-completed school - another promised, but undelivered, development project. They showed us the oil-damaged nets. Fishing was their livelihood, but most of the fish had gone away, they said, because of a barge sunk near the village which was leaking oil. Everyone we talked to condemned the violence and kidnappings. Some said it undermined their struggle to get greater local control of the oil wealth. But many also understood why the violence took place. As one local councillor told me, unless there is development, year after year, we will have more killings and kidnappings. From the banks of the river, we watched as a line of six small Nigerian navy patrol boats passed by the village, heading back to their base in Warri - the military's attempts to ensure security for the oil operations. As we ourselves headed back up the river, we rounded a bend to see the same patrol boats floundering in mid-stream, stuck on one of the hidden sandbanks. A reminder that in the end, the gunmen know the Delta, the military do not. From Our Own Correspondent was broadcast on Saturday, 11 February, 2006 at 1130 GMT on BBC Radio 4. Please check the programme schedules for World Service transmission times.